In 1939 Warner Bro. released The Wizards of OZ starring Judy Garland and Billie Burke. The film still remains as a CLASSIC for its striking visuals. Director Victor Fleming created this movie based on L Frank Baum’s book “The Wonderful Wizard of Oz”. When a studio like Disney plan a prequel on a masterpiece it’s always going to be high-risk. Director Sam Raimi (Spiderman trilogy fame) is a perfect choice for movie with dark elements and high end visuals. Johnny Depp turned down the role and Sam Raimi made James Franco act like Johnny Depp. Franco not right for this role, in my opinion. Mila Kunis as Theodora, one of Oz’s mysterious witches and her sister Evanora, played by Rachel Weisz, are given the bare minimum of screen time and character development. Both witches are okay in their roles. Michelle Williams’s a good witch Glinda is fine in her role. The best roles in Oz are Finley, a flying monkey voiced by Zach Braff, and China Girl, a small porcelain doll voiced by Joey King that Oscar rescues after the Wicked Witch destroys her village and kills her parents. When Oz unfolds, you can’t help but notice the similarities to Sam Raimi’s Army of Darkness (1992) in terms of the story: A hero arrives in a foreign land and reluctantly agrees to rid the area of a destructive force to serve his own selfish end. Sam Raimi’s direction was decent in parts. Some liberties have been taken from the novel written by L. Frank Baum, But predictable script and slow narration makes this flick tad too long and boring in parts. There are some nice touches with Oz the Great and Powerful opening with 4:3 aspect ratio, in black and white when the story takes place in Kansas which then switches to a vibrant, colorful Widescreen format we all know and love, when the action takes place in Oz. A nice tribute to the original. 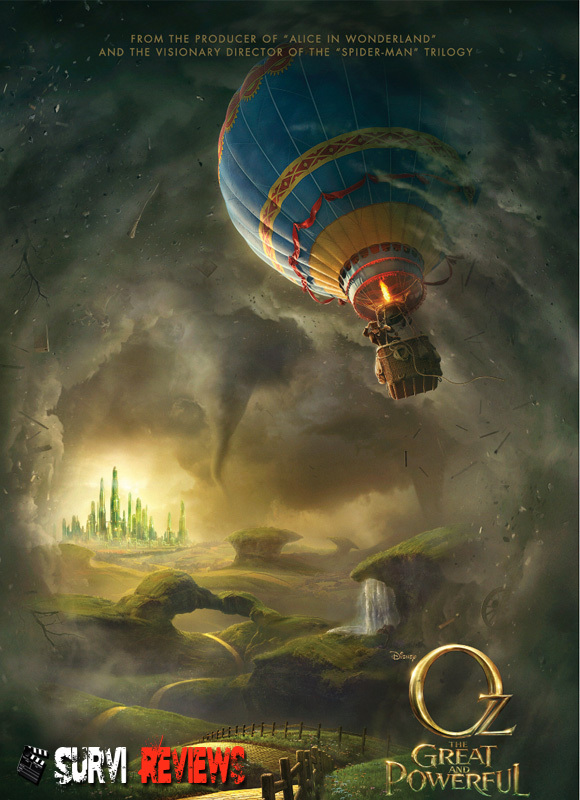 Oz the Great and Powerful lacks the magic, but it makes up with funny characters (Finley and China Doll) and gorgeous visuals. what about 3d can i watch this for the visual effects in 3d. Oz The Great and Powerful : “3D” is bright.. The landscapes are colorful, 3D effects and a climax that brings on not one but two evil witches, along with plenty of noisy explosions… I really don’t think its worth the extra few bucks per ticket.